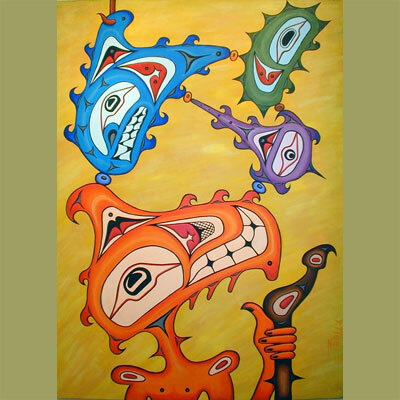 A new series and direction for respected West Coast, Native artist David Neel. 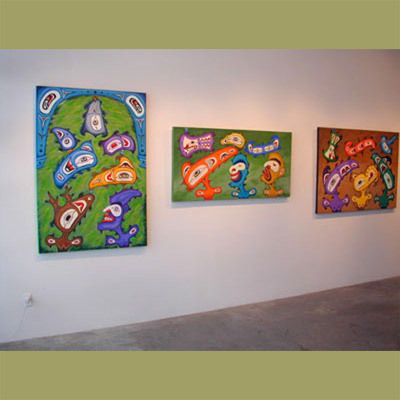 Over the last two years he has been relying on a number of new sources for his works on canvas. 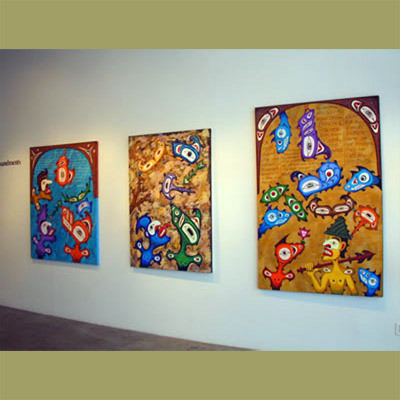 Better known for his photography, wood carving and jewellery this exhibition represented a new direction in Neel's work. 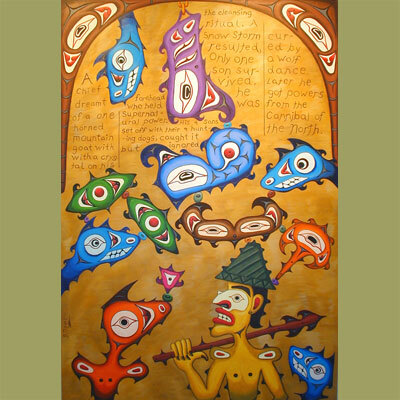 He has been researching devotional paintings from Europe and Kwagiutl legends, creating an unique allegory that speaks on Western philosophies and First Nations spirituality. 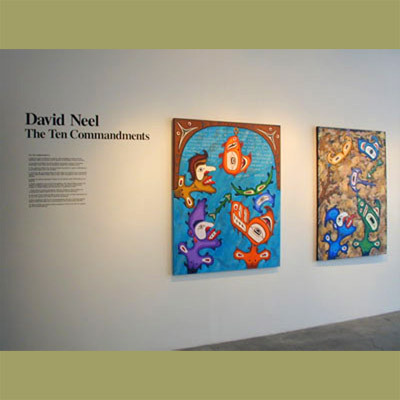 David Neel comes from a family of prominent artists, including grandmother Ellen Neel. 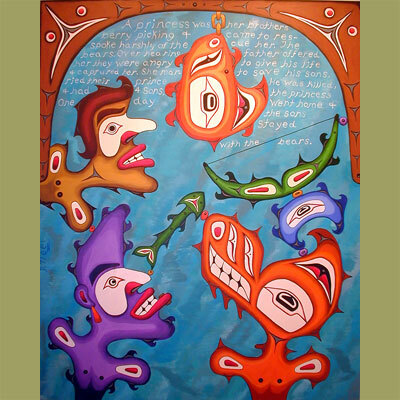 A photographer, mixed media artist, and carver, Neel studied fine arts and anthropology at Calgary's Mount Royal College from 1978 to 1980, and the University of Kansas until 1982. 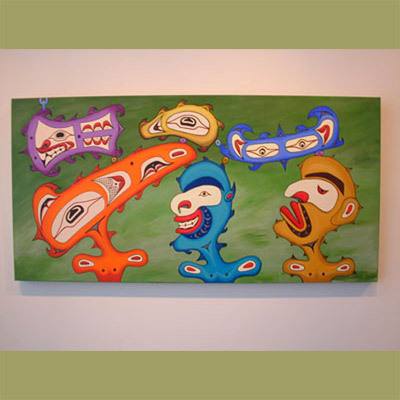 Following a career as a professional photographer in Texas, Neel returned to Canada and conceived two important projects: one documenting words and images of elders, the other the revival of Northwest coast great dugout canoes. 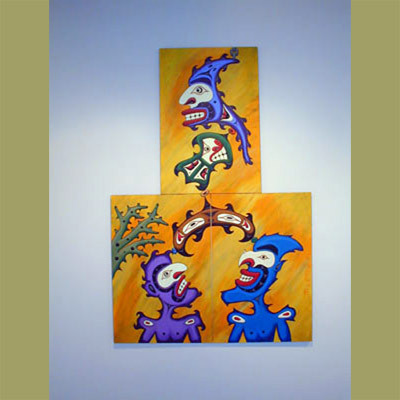 Neel has also carried out a series of twenty carved masks of contemporary subjects, such as the Mask of the Injustice System (1991), reproduced in the catalogue for the milestone exhibition, INDIGENA.